New this fall at Fancy Flours; Culinary Stencils! 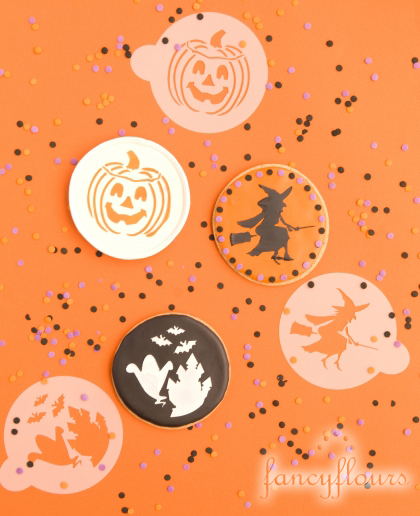 These fun and spooky Halloween Cookie Stencils create cookie masterpieces in a snap. 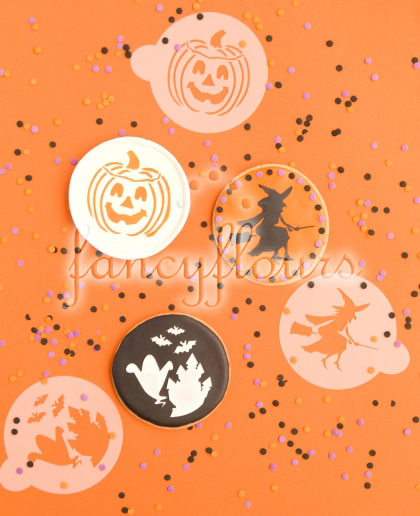 Made of food grade plastic, these stencils are reusable so make them part of your Halloween baking tradition. 1. Bake and cool cookies are directed. 2. Frost with royal icing or other icing that dries smooth and somewhat firm. 3. Let completely dry. then place stencil on top of iced cookies. Using a second coat of royal icing or powdered sugar use the stencil to create patterns on top of cookies. 4. Let completely dry before storing. I love the stencils and have them. Is there a secret to keeping the sugar and or glitter from getting under neath the cut out and making the image not so crisp???? These are so cute! I do a Halloween countdown on my blog where I post every day about something someone can make or buy for Halloween. I loved these and the web cupcake holder. CUTE!